half hidden by a mop of hair. `You’ve lost your head. It’s a poem about the search for identity and independence, about growing up and growing wiser and how it’s through this that we develop our crucial inner voice. In this case, the young man’s progress is aided by the gently dry ridicule of his father, whose words echo in his mind years later. I’m not sure if even long-standing fans of the Huddersfield poet would bring this into the classroom any more. The environment in 2018 feels simply too nervy and watchful. You’d probably have to contend with charges of homophobia (the father’s/Armitage’s/yours as a teacher), given that the poem’s tone is not one of bitterness and resentment against any injustice or prejudice within the father’s mockery. Rather, the older man’s reaction feels justified given the subsequent fiasco with ice on the ear lobe, a safety pin and a jeweller’s gun before ‘the whole became a sore, became a wound, and wept’. Of course, nowadays that ring through the nose reference might be a bit obscure for teenagers. Royal Show anyone? South of England Show? Would the young (even if they wanted to) be able to break off from their phones and visit an agricultural show where they might see a farmer leading a massive animal by the nose? You’d probably have one student in the class of today so indignant that any note of affection towards the remembered father is tantamount to non-inclusive and therefore hate-speaking language that you’d get a complaint from a parent. You’d be up before your Curriculum Leader. It just wouldn’t be worth it. Best play safe and choose another one. No, to play safe in 2018 what you need to do is steer well clear of humour. No wit, no wordplay, no irony, no mockery, no satire, not even light-hearted self-deprecation. All too risky. You never know who you might offend. The only time an exception can be made to all this is if you’re a comedian (perhaps on BBC radio) and your target is not on the political Left, not someone to see themselves primarily as a Global Citizen. And then you can go for it. Boris Johnson has recently tried to discuss a serious issue regarding women’s clothing in Muslim communities in Britain, but he committed the sin of using humour. Johnson is one of the few British politicians of any party who knows how to write. He knows that in order not to bore your reader (who can very easily stop reading) from time to time you need to deploy colourful language. This does not mean cheap language that is merely offensive or abusive, but it can mean language that uses colloquialisms, or derision or mockery or ridicule. What we need are politicians with the intellectual confidence to be provocative if that’s what it takes to get the public to think about difficult and challenging issues. The likening by Johnson of the burka to a letterbox is so arresting, and so amusing to many, including comedian Rowan Atkinson, because in visual terms it carries more than a grain of truth. There is an undeniable similarity. To say so is not Islamophobic, it is not racist and it does not incite violence against Muslim women. How long before it becomes culturally unacceptable even to voice the view that the burka is a strange and baffling thing for anybody to choose to wear in a liberal democracy? The fact is that the burka is a profoundly dehumanising garment. It is dehumanising because it removes the face, asserting the lie that the face is unimportant in the matter of human interactions. Because its purpose is to minimise communication from the wearer, the implication is that communication is an unworthwhile and undesirable enterprise. To that extent, the wearing of a burka is a hostile act. It is anti-social in the way it would be if we were to turn our back during a conversation. It is about secrecy and withdrawal and disdain for the surely defensible position that faces are precious and important in our understanding of each other. It says: ‘I will not show you my face, even when I am out in public, because to do so would be to give you information about who I am, how I am feeling and how I feel about you, about those around me, and I will not do that because we have nothing to do with each other. I am nothing to you and you are nothing to me.’ I’ve yet to hear an argument about how that is about mutual respect and social cohesion. Naturally, there are going to be those who claim that burka-wearing is a matter of individual choice. Sure, and if it’s a choice then it is one that is about resolute cultural separation rather than integration. If, however, it’s not about choice, then it’s about coercion and pressure brought to bear on women in communities that remain repressively patriarchal. Are we allowed to ask why a woman insists on doing what for many is extreme by concealing her face in public? Are we allowed to ask why Islam demands it? 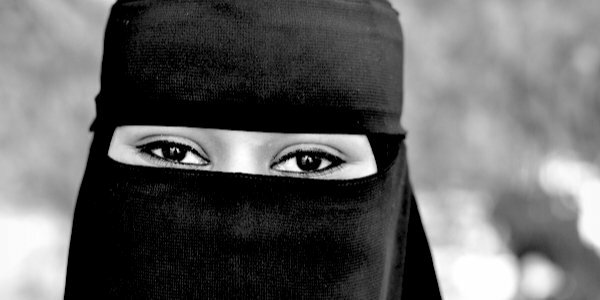 Are we allowed to ask if there are ever any girls and women who are forced to wear the burka? Are we allowed to ask if this doesn’t ever make the wearer feel disempowered and invisible and voiceless? The storm over Johnson’s article would suggest a series of negative answers. But then that storm is a diversionary tactic about language rather than the issue itself. The concocted noise is as usual from those whose agenda is political, those who would see Johnson hung out to dry even if he were discovered to be homing child refugees. It is to be hoped his refusal to apologise continues. It is also to be hoped that burka-wearing women themselves get fed up with the screen that renders them all but invisible and keeps them ‘easily led’. Because it doesn’t look like a ban is coming any time soon. Much easier to shut the debate down, draw a veil over it. Head down and keep quiet. Like a woman in a burka.